The Company of organic products from Almería participates in Asia Fruit Logistica. 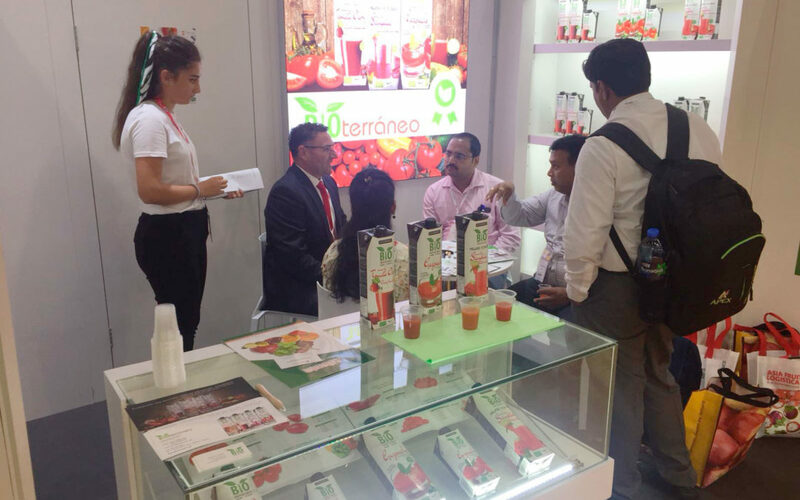 Organic products company Bioterráneo participates until September 7 at the Asia Fruit Logistica international fair held in Hong Kong. The company’s goal is to open new sales channels in the Asia-Pacific region for its organic products, which are currently exported to countries such as the United States, Belgium, England, Canada or Spain. “It is the first year that we participate in Asía Fruit Logística and we see it is possible to open new distribution channels for our products in countries such as China, India, Singapore or in Hong Kong where day by day the demand for organic products grows and we see that there is great interest in European products, “says Josep Prat Scaletti, Marketing Director of Bioterráneo. Bioterráneo, a subsidiary of Bio Sol de Portocarrero, expects to close commercial agreements to distribute its gourmet organic products such as organic gazpacho, organic cherry tomato juice or organic watermelon juice. Also, during this appointment in Hong Kong, Bioterráneo has presented its half-liter containers. Through this innovative individual format, it aims to facilitate the consumption of gazpacho and organic juices in workplaces or on the street, thus promoting healthy, balanced and, of course, sustainable and respectful food with the environment. “Undoubtedly our flagship product is the Organic Gazpacho and the new half-liter container is having a great reception, one of the advantages of our gazpacho is that thanks to the pasteurization system that we use in its preparation, it is not necessary to keep it cold. that facilitates its export, “remarks Scaletti. Asia Fruit Logistics of Hong Kong is the most important trade fair for fruit and vegetable products held in the Asia Pacific area, in its latest edition attended by more than 800 companies from 43 countries and was visited by 13,000 professionals from 76 countries.